PCX is an image file format that uses a simple form of run-length encoding. It’s lossless. The ZSoft Corporation of Marietta, Georgia, USA developed it as the native file format for their PC Paintbrush graphics program, which used to be quite popular with early PCs’ users. Nowadays it has been largely replaced by GIF, JPEG and PNG which support better compression. Because colors 0x00..0xc0 are compressed better than colors 0xc1..0xff, good palette sorting is important. It's usually (but not always) enough to move the most-common colors into palette positions 0x00..0xc0, and least-used to palette positions 0xc1..0xff. The complete algorithm for sorting the palette is to count how many times a color appears 63N+1 (for nonnegative integer N) in a row, as it's only possible in such cases to use unprefixed color values to improve compression, and move colors with higher count into indexes 0x00..0xc0, and all others to 0xc1..0xff. This is warranted to produce optimal results. This compression algorithm is very fast and takes very little memory, but is not very efficient, especially in compressing real-world images. 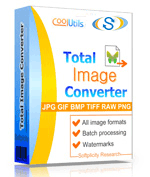 So if you prefer to convert PCX to more popular formats like TIFF, JPEG, PNG use Total Image Converter. It does the job perfectly in 3 easy-to-follow steps.